The toilet is the largest consumer of water in the bathroom. Installing the water saving Toilet Tank Bank from Niagara Conservation is a quick and cost-effective way to save water at this source. This is a displacement bag that saves about 0.8 gallons of water per flush when installed, and after time this can add up. It is entirely safe to install, and does not damage the toilet in any way. Be prepared to start saving water! How much water does the Toilet Tank Bank hold and how much water does it actually displace? 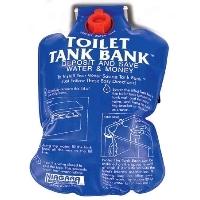 The toilet tank bank holds 0.8 gallons of water. It displaces 0.8 gallons of water per flush. How come this bank is so inexpensive. Is it temporary? Does it need replacement often? This is a low cost item because it is disposable and produced in large volume for a wholesale distributor. The longevity of the bag is approximately 5 years and is contingent upon the quality of the water it is placed in. How does this bag work? Does it interfere with water in tank when toilet flushed? The bag (filled with 0.8 gallons of water) hangs on the inside of the toilet tank. When the toilet is flushed, the tank will fill up with 0.8 gallons less water every time.